A very Happy New Year to you, and welcome to a new beginning that is promising to be anything but “boaring”! 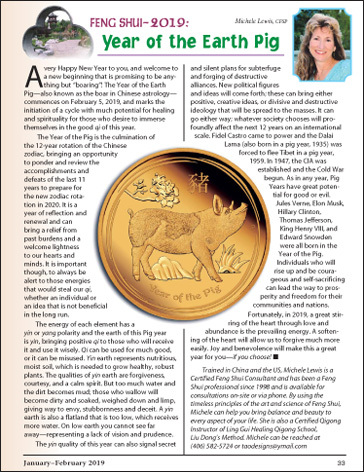 The Year of the Earth Pig — also known as the boar in Chinese astrology — commences on February 5, 2019, and marks the initiation of a cycle with much potential for healing and spirituality for those who desire to immerse themselves in the good qi of this year. an idea that is not beneficial in the long run. 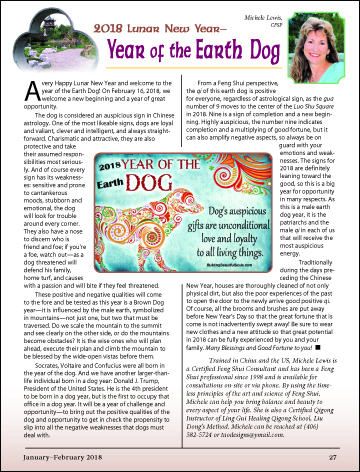 A very Happy Lunar New Year and welcome to the year of the Earth Dog! On February 16, 2018, we welcome a new beginning and a year of great opportunity. The dog is considered an auspicious sign in Chinese astrology. One of the most likeable signs, dogs are loyal and valiant, clever and intelligent, and always straightforward. Charismatic and attractive, they are also protective and take their assumed responsibilities most seriously. And, of course, every sign has its weaknesses: sensitive and prone to cantankerous moods, stubborn and emotional, the dog will look for trouble around every corner. They also have a nose to discern who is friend and foe; if you’re a foe, watch out—as a dog threatened will defend his family, home turf, and causes with a passion and will bite if they feel threatened. 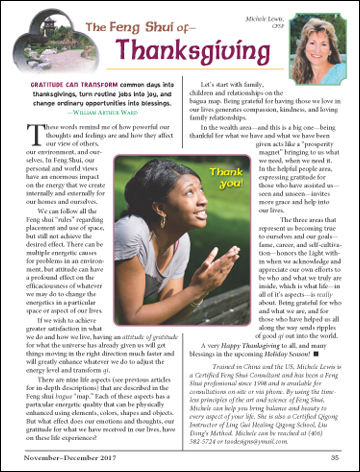 Gratitude can transform common days into thanksgivings, turn routine jobs into joy, and change ordinary opportunities into blessings. —William Arthur Ward These words remind me of how powerful our thoughts and feelings are and how they affect our view of others, our environment, and ourselves. 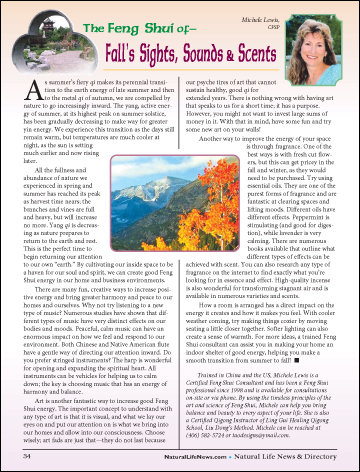 In Feng Shui, our personal and world views have an enormous impact on the energy that we create internally and externally for our homes and ourselves. We can follow all the Feng shui “rules” regarding placement and use of space, but still not achieve the desired effect. There can be multiple energetic causes for problems in an environment, but attitude can have a profound effect on the efficaciousness of whatever we may do to change the energetics in a particular space or aspect of our lives. 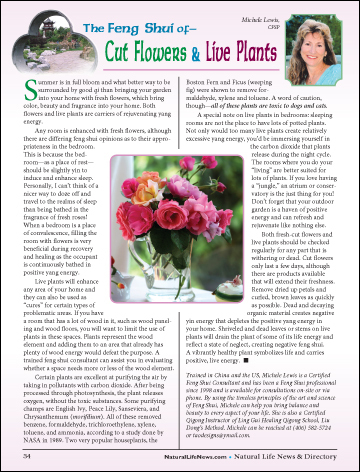 Summer is in full bloom and what better way to be surrounded by good qi than bringing your garden into your home with fresh flowers, which bring color, beauty and fragrance into your home. 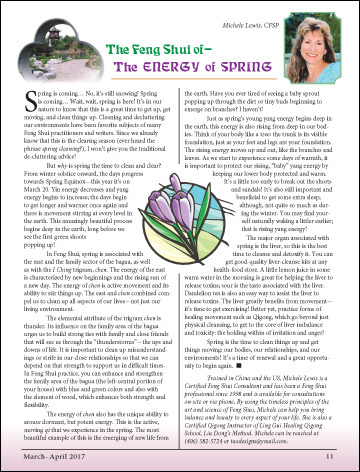 Both flowers and live plants are carriers of rejuvenating yang energy. Any room is enhanced with fresh flowers, although there are differing feng shui opinions as to their appropriateness in the bedroom. This is because the bedroom—as a place of rest—should be slightly yin to induce and enhance sleep. Personally, I can’t think of a nicer way to doze off and travel to the realms of sleep than being bathed in the fragrance of fresh roses!